Cool out with Molly & the Ringwalds at Mixers! It’s summer in Houston and that means that the humidity is knocking at the door. Most ladies dread that frizzed out hair look, but not you! You’re going to make the best of that crazy do by putting on that off the shoulder shirt from Express, those white hot leggings from American Apparel, and you’re going to Vogue like Madonna always wanted! Go ahead, pair that crazy outfit with checkered keds – why? Because Molly & the Ringwalds will be playing at Mixers & Elixirs this Friday night! That means the craziest, coolest, most tubular band is going to ROCK OUT at HMNS under the dinos. See you at 6 p.m.! Be there or be square! 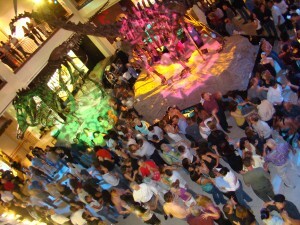 Many more fabulous Mixers to come – check out mixershouston.hmns.org for more info! “I love my job!” As promotions manager, Jamie throws parties for a living, and she can’t wait to share the fun.